There was a time when people thought the Earth was flat. But Ferdinand Magellan, a famous Portuguese explorer, took the initiative to disapprove this rumor by sailing around the world in the year 1519 and since then, we’ve been dominating the oceans. If you’re the type who wants to explore and set forth for kayaking adventures in deep bodies of water, then you should opt for sea kayaks. I’m not saying that you have to go to the extreme level like Magellan (you can if you want to); but with your sea kayak, you can head towards any destination you want. You can use your sea kayaks for trips spanning from days to a few weeks. These kayaks are specifically built for deep sea fishing and for kayak fishing tournaments. However, you can still use them on lakes, seas, lagoons, and bays. Sea kayaks are different from other kayaks as they have covered decks and can allow incorporation of spray decks. Sea kayaks have some very special features that you need to be informed of for identifying them so you don’t mix them up with canoes. They can accommodate one to three paddlers who face forward, using paddles that are double bladed. The deck of a sea kayak is always covered. Sea kayaks can withstand rough waves, which is exactly why they are perfect for deep sea fishing expeditions. A sea kayak has the ability to carry all the basic necessities and accessories for you to stay safe and continue fishing in the ocean. Using sea kayaks, you can explore marine life like you’ve never done before. Wouldn’t you want to take photos when orcas are dancing behind you? Wouldn’t you take the opportunity to paddle your kayak along with a school of dolphins or humpback whales? How about going to the tropical regions with your sea kayak? You might end up encountering sea lions and other tropical fish along the way. Sea kayaks are environmentally friendly as well. When you go kayaking, make sure there is no disturbance in the ecology of the marine species caused by you. As long as you don’t do that, you can safely kayak and fish on the water. 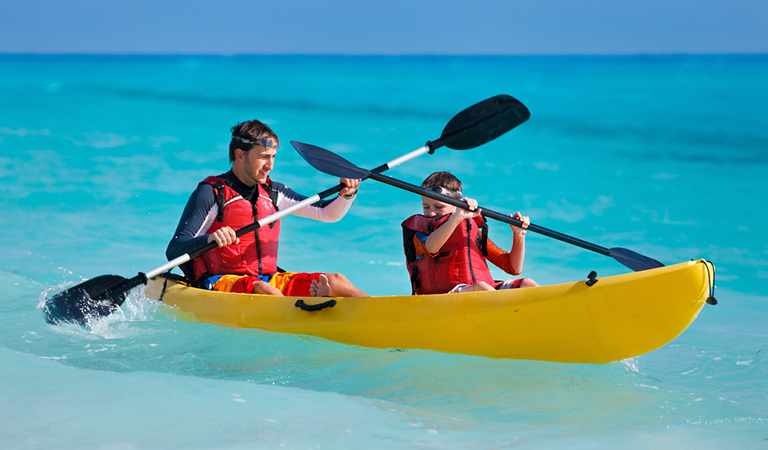 Unlike canoes, sea kayaks are appropriate for both beginners and advanced users. Veterans and young adults can use sea kayaks as they’re not too complicated to paddle around. Still, there are few things you need to follow in order to ensure your kayaking experience never goes awry. It is essential to wear appropriate clothing. Wearing a wetsuit is a good idea along with waterproof shoes. Bring a clean towel so that you can dry yourself. Wear sunglasses and caps so that you can protect yourself from sunlight. Also, remember to avoid wearing expensive clothes or jewelry. Deep sea fishing is a popular activity among sea kayakers and you could be just one of them. Deep sea fish are usually found below the region of water where sunlight is able to reach. You can fish for bluefish, redfish, marlin, kingfish, snapper and even take down a shark if you’re willing to go to the great heights. If you’re lucky, you could even see a baby humpback whale nudging your kayak out of curiosity. Deep sea fishing covers a depth of at least 1000 feet. That’s why you should take a charter and an experienced guide with you if you’re a beginner. Locals can actually better point out where fish might be readily available for you to catch. 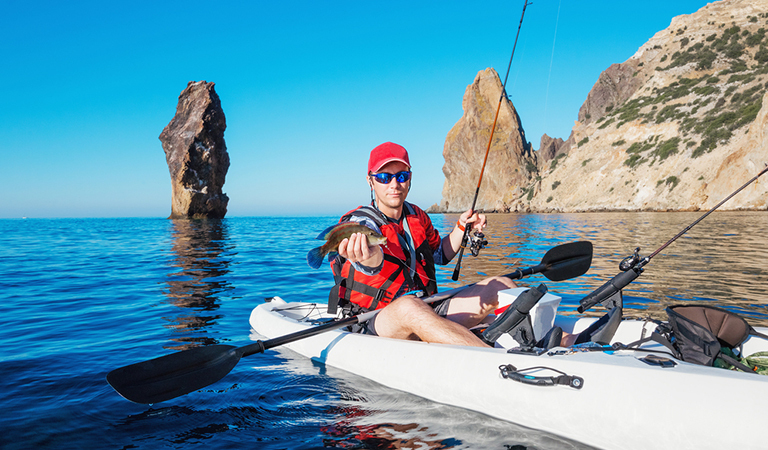 Prepare all the necessary equipment and accessories on your sea kayak and remember to take your fishing license with you. Get rods, lines and reels specifically designed for deep sea fishing. They’re generally longer and stronger than the freshwater fishing equipment. Apply waterproof sunscreen since you will be spending a lot of time in the sun. If you get motion sickness, take medicines with you. In fact, you should take all the necessary medications, if possible. 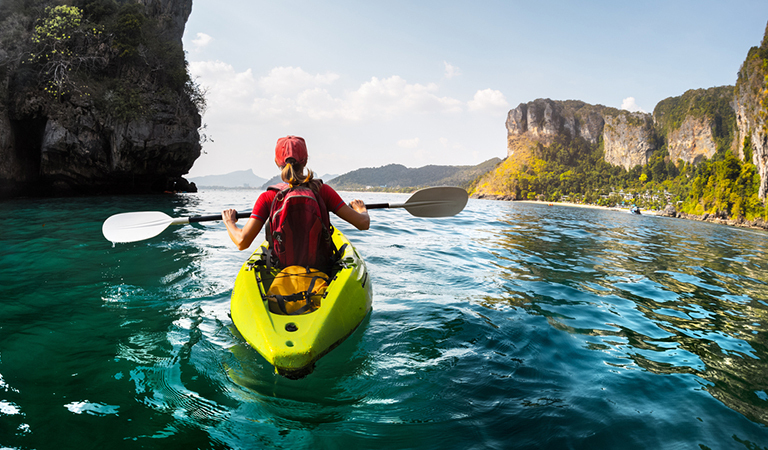 Try to avoid alcohol while kayaking; but if you really have to, drink as moderately as possible because dehydration out in the middle of the ocean could result in a serious hangover. 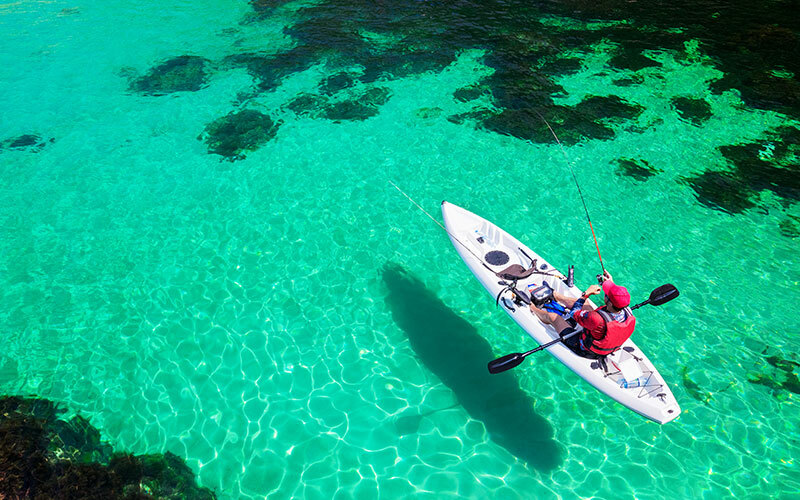 You could easily lose control over your kayak. When you go to a particular area for fishing, know the rules and regulations for fishing in that region just to be on the safe side. Always keep your radio on for any updates on weather forecasts. Certain spots can be a haven for fish, such as trenches and reefs. Head to these kinds of locations first. Reefs usually teem with marine life, so you could head there first. Be careful not to disturb the reef system in any way. You can get tuna under some debris under the ocean or even swimming next to dolphins. Bait depends on the kind of fish you’re aiming to catch. But for deep sea fishing, live or artificial bait is usually used. Live baits such as squids, minnows, mackerels and shrimps are used to attract large fish, including sharks. If you don’t get a bite, try to mix up and use fresh bait from time to time. There are various styles of fishing, one of them being trolling. Trolling involves dragging a fishing line along the bottom of shallow waters to catch small fish. But to catch the larger ones you can do chumming. Leave a line of bait in the water, then wait and see if there are any movements. If something catches your eye, throw a large amount of bait there to attract more fish and to create a feeding frenzy. Make sure your fishing lines don’t cross the paths of other people’s fishing lines. Have fun with your crew members! Deep sea fishing is the perfect way to improve your fishing skills and understand the marine life. However, it’s difficult to explore the sea and go beyond certain crevices and corners in giant ships or rigid boats. Get a top-class sea kayak to avoid such issues because it’s perfect for traveling large distances, covering places where you otherwise couldn’t go. Take your crew members along with you so that when you catch a larger fish, you and your members can reel it in together. Using your sea kayak, you can even go snorkeling underwater, playing with dolphins and checking out the reefs. Take a camera with you and make your own documentary on your fishing experiences. 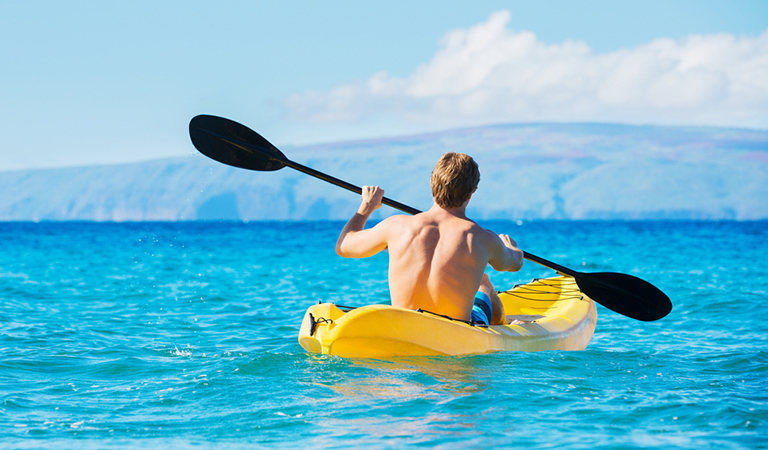 Sea kayaks are sturdy and they are not so easy to sink, so be sure you’ll be safe in the ocean.